We will sort, load, and haul away waste from any strip-out, maintaining strict compliance with all regulations throughout the process. At Junk Collection, we offer a variety of options for clearing rubbish from strip-outs, including skip hire, and wait and load. Working with builders as well as deconstruction crews throughout, Junk Collection have established a reputation for excellent work and superior customer service. Before any project, we carefully consider the particular requirements for the work involved, and can advise you regarding the most appropriate solution for your needs. Our complete waste management service includes Strip-out Clearance, Demolition clearance, and Skip hire . 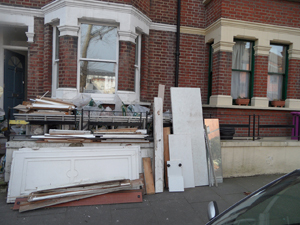 Junk Collection clients are usually able to save money by using our services for their waste management needs. We can provide you with a range of containers and vehicles. We keep landfill waste to a minimum by recycling as much waste as possible. You can count on Junk Collection for a consistently high level of customer service. Call Junk Collection today for a free quote on strip-out waste removal or any of our other waste clearance services .